The Goring Gap is the only location in the British Isles situated within two separate Areas of Outstanding Natural Beauty (AONB). It is a beautiful valley with the Oxfordshire bank in the Chilterns AONB and the Berkshire bank in the North Wessex Downs AONB. At the intersection of three ancient trading routes (The Ridgeway, Icknield Way and river Thames), Goring has always been a thriving community, especially since the arrival of the railway, and is now a popular tourist destination for visitors who enjoy the spectacular views and scenery it has to offer. It has been the inspiration for such classic books as Wind in the Willows and Three Men in a Boat. The natural beauty of the Goring Gap makes it a very special location and has been described as a 'Jewel in the Crown' of the Chilterns Area of Outstanding Natural Beauty. Residents, therefore, have a very strong 'sense of place' and pride in their villages and are very protective about their beautiful environment. AONBs are of such distinctive character and natural beauty and are considered so precious that they are designated and protected by two pieces of legislation (National Parks and Access to the Countryside Act 1949 and The Countryside and Rights of Way Act 2000). An AONB has the same level of protection in the National Planning Policy Framework (NPPF) as a National Park. The NPPF states that: "great weight should be given conserving landscape and scenic beauty in National Parks, the Broads and Areas of Outstanding Natural Beauty which have the highest status of protection in relation to landscape and scenic beauty". 'Despite not requiring normal planning permission due to its ‘Permitted Development Rights’, it is argued that Network Rail has a duty to respect the protection of the Goring Gap, since it has recognised the harm to the AONB that electrification is doing in its own Environmental Statement (available in Documents and Downloads). The flatter terrain on the Oxfordshire side in the Goring Gap (Chilterns AONB), was the obvious route chosen by Victorian engineer Isambard Kingdom Brunel for the Great Western Railway to connect London with Bristol. Brunel built two, near identical, 4 arch viaducts over the Thames within the Goring Gap, crossing the river at Goring/Basildon (Gatehampton Viaduct) and about 3 miles upstream at Cholsey/Moulsford (Moulsford Viaduct). Both bridges are now listed and protected due to their elegant architectural design, exceptional brickwork and historical interest. Geology: Around 10,000 years ago, when the last ice age ended, the melt water caused sea levels to rise sufficiently to flood the valley between Britain and northern mainland Europe. Britain became an island. 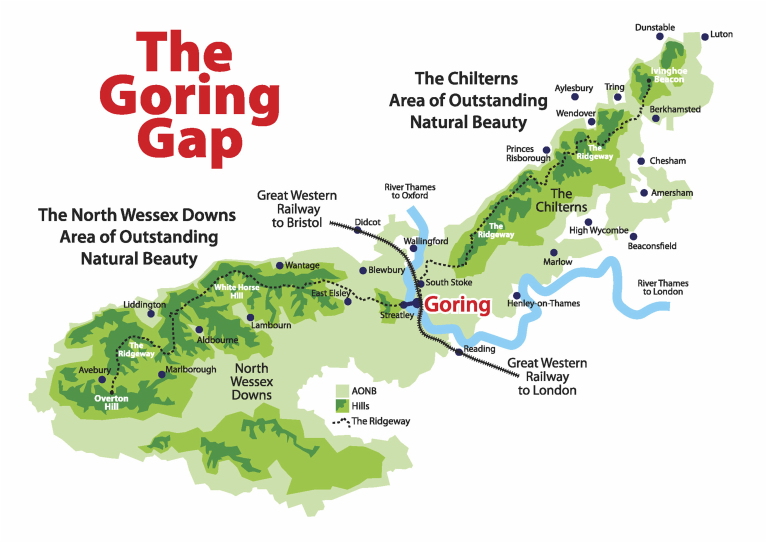 The ‘Goring Gap’, the glacial valley carved out of the chalk in the last ice age created the current, more southerly route of the Thames. The ice that flowed through the soft chalk created this wooded valley, steeper on the Streatley (Berkshire) side than the gentler slope on the Goring (Oxfordshire) side. The source of the Thames is in the Jurassic limestone of the Cotswold hills. It then flows onto Oxford clay before cutting into the chalk escarpment of the southwestern end of the Chiltern hills, here in the Goring Gap. As a consequence of our geological location, Goring is a major provider of water to the region for about a third of a million people. In the Gatehampton area of Goring there are seven major boreholes in the chalk which form the largest groundwater abstraction project in Europe. Goring is very old. It has been occupied for at least 10,000 years and evidence of man having settled in Goring after the end of the last ice age is well documented. Flint blades and reindeer bones were found in Gatehampton (southern Goring), where settlers butchered migrating animals at the narrowest section of the Goring Gap, being a river crossing point. A 10,000 year old mammoth’s jaw was found by bathers in the river in Goring relatively recently, which can be seen in the Oxfordshire Museum in Woodstock. The Chilterns AONB covers 324 square miles of countryside, stretching from the River Thames in Goring, southern Oxfordshire, up through Buckinghamshire and Bedfordshire to Hitchin in Hertfordshire. It is one of 38 AONBs in England and Wales, which belong to the same family as National Parks. Its designation as an AONB in 1965 recognised that the Chiltern Hills contain some of the finest landscapes in the country which are worthy of protection at the highest level. The North Wessex Downs AONB is an area covering 668 square miles between Reading and Swindon to the East and North, and Andover and Devizes to the South and West. It is one of the largest tracts of chalk downland in southern England. The importance of the surviving downland habitat and ancient woodland is matched only by its archaeological significance. Along the Ridgeway from Streatley to Avebury are dotted some of the most prehistoric locations in the country, including the Stonehenge and Avebury World Heritage Site and the magnificent, world-famous chalk-cut figure of the White Horse at Uffington.